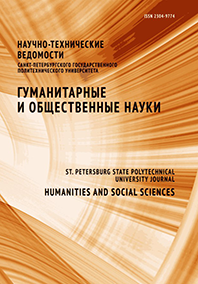 Evseeva Lidia I. Evseev Vladimir V.
The article analyzes the new forms of informational impact on the transformation of social communication, aiming to identify the capacious resources of human adaptation in the communicative environment. The importance of the research subject is proved by the complexity of human social adaptation in the conditions of electronic communication, the increasing effect of media structures on social living standards, particularly the sphere of spiritual value orientation. The authors develop the hypothesis of the influence of communication technologies on the organization of cognitive processes in the society. The authors use a number of specific socio-psychological approaches for studying the degree to which the process of the transformation of the communicative environment governs the changes in the consciousness and human behavior. communication and information media, on the one hand, are capable of quickly and effectively influencing the public consciousness and manipulating it, but on the other hand, contribute to the purposeful development of the personality and have a positive effect on the adaptation processes. communication media and information technologies not only set the parameters of public space, but also affect human perception of the changing interaction patterns. The analysis allowed to substantiate the conclusions that the simultaneous presence of a person in the real and the virtual space has a destructive effect on the personality, while the human need for safety necessitates the search for human adaptation parameters in new communicative environments. The trend can be noted to the consolidation of the horizontal hierarchy of social interaction. The trend for the consolidation of the horizontal hierarchy of social interaction is emphasized. The necessity of changing the normative value regulation of human relationships in the society is substantiated based on a new structure of informational interaction. The data presented in the article can be of practical value in predicting adaptation models in network environments.